JNN 02 April 2015 Aden : After clashes with groups loyal to Yemeni President Abd Rabbuh Mansur Hadi, Houthis took also control of the Presidential Palace in the city of Aden. After already in control of Presidential Palace in the Capital of Yemen , Sanaa . Houthis have taken control of the residence of Yemeni Fugitive Ex President Abd Rabbuh Mansur Hadi in the southern city of Aden, with clashes between the Shia Houthis and groups loyal to Hadi having killed 15 people, a local source has told Sputnik Arabic. “Houthis have taken control of the presidential residence [in Aden], clashes are taking place around the residence between Houthis and armed groups that support President Hadi. Civilians who have answered the call of [Yemeni] Foreign Minister Riyadh Yaseen to protect the city and restore control over the residence are also taking part in the clashes,” the source said. 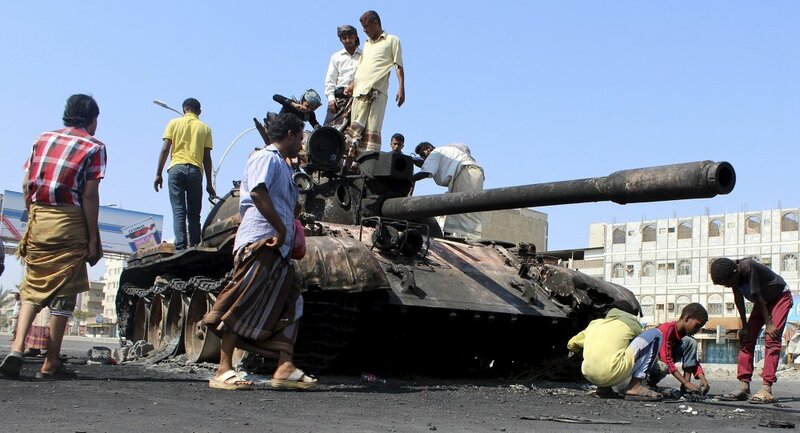 The fighting has wounded dozens of people and killed 15, according to the source, who added that a ground operation could be launched in Aden with the aim of pushing Houthis out of the city. 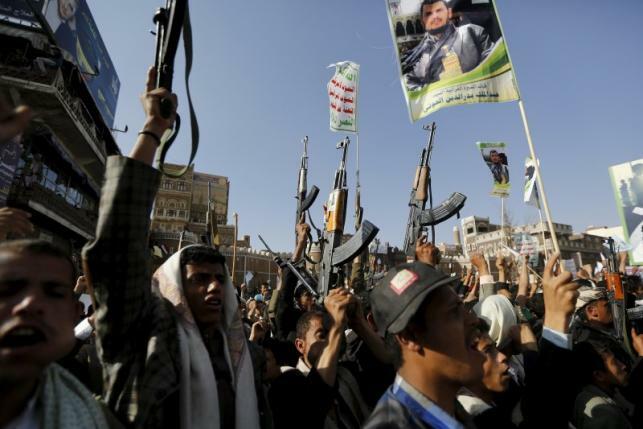 The Houthis, a Zaidi Shia insurgent group, has taken control of vast areas in Yemen. The Houthi Fighters took the control and the Yemen’s government was Left with no Option but to resign in January and Currently Shia Houthis control the capital Sanaa. Hadi has fled the country. On March 25, a Saudi-Arabia-led coalition started conducting airstrikes against Houthi Fighters in Yemen at the request of Hadi, who asked for military support. The ongoing Saudi Arabia-led coalition’s aggression aims to defeat the Houthis, who are supporters of ex-Yemeni president Ali Abdullah Saleh, and restore Hadi’s government to power. On Tuesday, spokesman of the Saudi-led joint operations command in Yemen Brig. Gen. Ahmed Asiri told reporters that a limited ground offensive might be carried out in parts of Yemen that are under Houthi control. Dozens of unidentified troops landed by sea in Aden in an apparent last-ditch effort by a Saudi-led coalition to shore up a foothold in the southern Yemeni port city after Shi’ite Houthi fighters seized control of its centre on Thursday. And almost 95% of Yemen is already in control of Shia Houthi Fighters. The soldiers arrived in a single vessel a few hours after the Shia Houthis and their supporters swept into the heart of Aden despite an eight-day air campaign led by Riyadh to stem their advances. The southern port city has been the last major holdout of fighters loyal to the Saudi-backed President Abd-Rabbu Mansour Hadi, who fled Aden a week ago and has watched from Riyadh as the vestiges of his authority have crumbled. It was not immediately possible to verify the nationality of the troops, but the Saudi-led coalition says it is in control of the waters around Aden. If confirmed as a coalition move, it would be the first reported deployment of ground forces since Saudi Arabia launched the campaign a week ago. The Houthis, who took over the capital Sanaa six months ago in alliance with supporters of former president Ali Abdullah Saleh, turned on Aden last month and have kept up their advances despite the Saudi-led intervention which aims to return Hadi to power. Residents of Aden’s central Crater district said Houthi fighters and their allies were in control of the neighbourhood by midday on Thursday, deploying tanks and foot patrols through its otherwise empty streets after heavy fighting in the morning. “People are afraid and terrified by the bombardment,” one resident, Farouq Abdu, told Reuters by telephone from Crater. “No one is on the streets – it’s like a curfew”. Another resident said Houthi snipers had deployed on the mountain overlooking Crater and were firing on the streets below. Several houses were on fire after being struck by rockets, and messages relayed on loudspeakers urged residents to move out to safer parts of the city, he said. A Houthi spokesman said late on Wednesday that the fighting in Aden showed that Saudi Arabia’s military intervention had failed. “The victories in Aden today embarrass this campaign and silenced the aggressor states,” Mohammad Abdulsalam told the group’s al-Maseera television. This entry was posted in Middle East and tagged Abd Rabbuh Mansur Hadi, Aden, presidential palace, Sana'a, Shia Houthis, Yemen, Yemeni President Abd Rabbuh Mansur Hadi. Bookmark the permalink.